Back in 2009, Mr. H and I took a little trip to Taos, New Mexico. While there we visited a local furniture shop and a vessel sink caught my eye. It was black and red with cherry blossoms inside and on the front. It was love at first sight. I was inspired to design a guest bathroom around this sink when we moved into a bigger house someday. We bought it and stored it in the basement still in its wrapping. Fast forward to 2013, we were in the new house and it was time to renovate the guest bathroom! I had not seen the sink in four years because I wanted to forget what it looked it and have it be a surprise to myself when I saw it again. I was kind of nervous as Mr. H unwrapped the sink. I hoped I would still like it as much as that day four years ago...and I did. I still loved it. I loved this red Chinese cabinet, but it was too wide for the space. Then on a trip to Nebraska (both Mr. H and I grew up in Nebraska and both of our families are still there) we stopped at an antique shop and found the perfect solution! 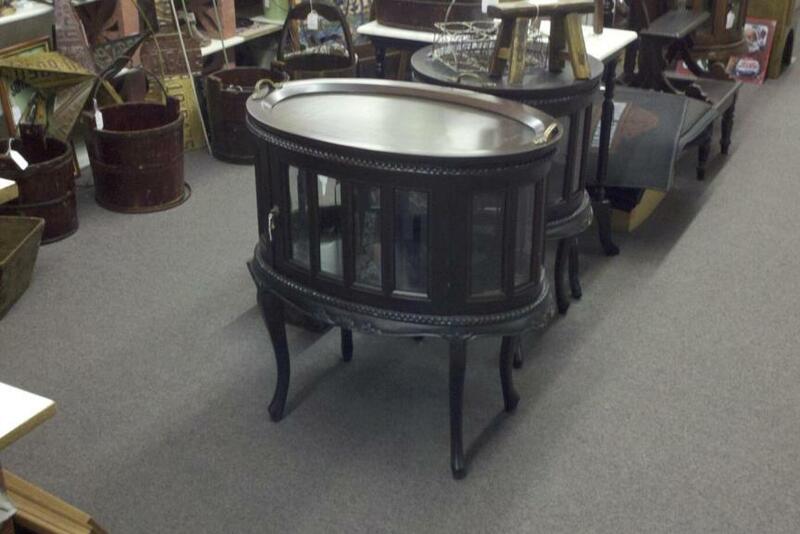 It was a curio with a removable tray on top. There were doors on the front and back so the back one could be removed to allow plumbing to pass through. With the dark wood and the curved legs, I thought it would complement the Asian look I was going for and it was only $160! This was what we were looking for and we took it home. Our plumber drilled the hole for the drain, placed the sink on top and installed the fixtures. It turned out beautifully! Here is the finished product. 1) Take into consideration the total height of the sink and vanity once the sink is placed on top. While shopping around, I found the average height of a bathroom sink to be around 35". 2) Make sure the vanity is deep enough to accommodate the sink and plumbing fixtures. 3) Decide if you are going to replace the top of the vanity with a countertop or keep the current top. 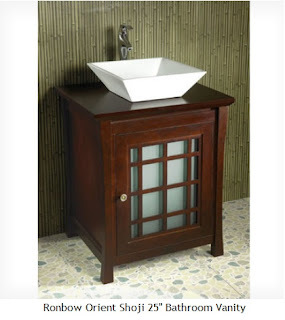 4) If the vanity is a wood product, protect it with some kind of finish so it doesn't get water damage. Our contractor sprayed a low sheen wood protectant on our vanity. 5) Decide what kind of faucet you will use. If you choose a vanity mounted style, more holes will have to be drilled into the vanity to accommodate the fixture. Oh my heck, your new vanity is gorgeous!!!! The curio and sink complement each other perfectly. Great work! The sink is amazing to begin with, but the cabinet you chose is the perfect piece to compliment it. I would spend my day washing my hands if I were you! Ha, ha, Magali! I suppose my hands are much cleaner now :). Thanks so much for stopping by! Love your vanity, nicely done! Lori here from Color It Simple following you back. Thank you, Lori! And thanks so much for visiting me and following. Have a great day! Thank you Khammany for visiting my blog. I'm interested to check out your decor ideas and yes Europe is my fave place to visit too. Hello! Thanks so much for stopping by! Yes, I can't get enough of Europe and Australia is wonderful too. I've only been there once, though, but just loved it! What a fabulous reveal! It so pays of when someone does a little research, doesn't it? And yours, my friend, is the case in point! 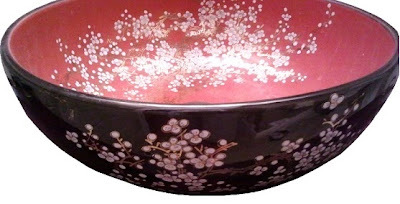 Your new cherry blossom inspired sink and vanity are sweet and chic! Hi Poppy! Thanks so much for the kind comment! Sweet and chic...I love it! That is the most beautiful sink vessel - one of the prettiest I've ever seen! And to find that piece of furniture to fit it on...too perfect. I love how the faucet and handles are in the wall. Great vision! Hi Melanie! Thank you! That was one of the big decisions...faucet coming out of the vanity or out of the wall? I'm so glad we decided out of the wall! Thanks so much for stopping by! This is so funny, I did this too. 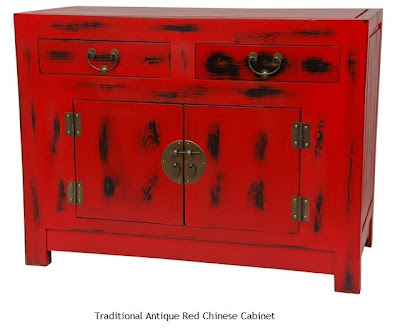 I was able to use a cabinet exactly like that red one. I love your combo! Unfortunately, the wood top on mine has not held up well. I will be fixing that soon. What a great piece and how unique! You have a great eye and I love how you are selecting things with a story that relates to your past. That means so much. Beautiful! Your vision turned out perfectly!! 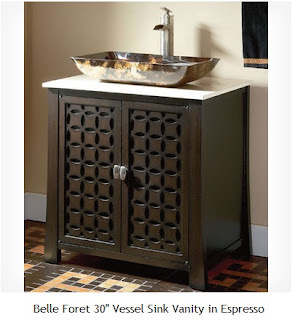 Both pieces complement each other beautifully, together they make your guest bathroom seem like a spa! Enjoying your blog and happily following along! Love the cherry blossom sink and cabinet. Very beautiful!